Onkyo has once again released a solid, great-sounding pair of headphones. While Hi-res Audio compatibility is the big selling point of the H500BTs, it's the Bluetooth capabilities that won us over. Manufacturers the world over are clamouring to get a Hi-Res Audio seal of approval on their cans, and for good reason: it has the potential to be one of the more lucrative areas of the headphone market. Couple Hi-Res Audio with wireless capabilities and, in theory, your headphones should jump from shop shelves on to the heads of audiophiles everywhere. Enter the Onkyo H500BT. Priced at £169.99 ($250), the Onkyo H500BT wireless range is one of the latest to get the Hi-Res Audio stamp, something that is only conferred on headphones that produce a bandwidth of 40kHz. The H500BTs offer this, but there is a caveat: the range can only be achieved when you use the included audio cable. If you're a free-flowing wireless junky, then the highest frequency range you'll hear will be 23.5Khz – which is still impressive, but won't scratch that hi-res itch. The good news is that Onkyo has opted for aptX streaming tech, which works its magic to make sure the quality of the audio you do hear wirelessly isn't squeezed because of the limited bandwidth Bluetooth offers. Regardless of the science behind what makes Hi-Res Audio tick, headphones with this badge will only entice if they hit the sweet spot of non-cumbersome and good-looking design, comfort, and epic sound quality. The H500BTs manage to do this. Just. There's nothing flash about the design of Onkyo's latest; they've been built for comfort, and while there are a few stylistic flourishes, they don't scream 'look at me'. This is no bad thing – these headphones weren't built to bring in the Beats crowd, but rather those who prefer their music a little more nuanced. The Onkyo H500BTs are solid, too. The housing feels sturdy in the hand, and when you pop them on your ears they grip well. A solid aluminium frame means that when you walk in them they don't bounce, either – something that can cause havoc with the acoustics. This rigidity means vibrations are kept to a minimum. 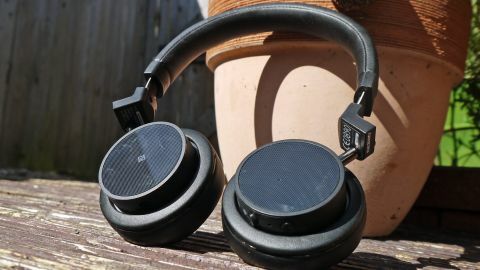 Although they aren't noise-cancelling, the ear pads – memory-foamed and extremely comfy – do stick to the ears well, preventing outside noise from making an entrance. The band is coated in leather, too, for extra comfort. The adjustable headband is noisy as it clicks into place, but at least it's sturdy – at no point did it feel like it was going to come apart in your hand. The earcups are attached by a small aluminium pole, which means that no matter the shape of your ears, they'll rest well on your head. They also rest flat around your neck if you want them to. The functional design is evident in the colour options too. The H500BTs are available in no-nonsense black or white; the only hint of actual colour on these headphones is a splash of red to denote the 'right' ear cup. In keeping with this theme, there are only two physical buttons. The 'on' button is sunk more into the body of the device, and the Bluetooth button has been made bulkier. This makes complete sense when the headphones are on, given that you'll usually turn the headphones on before you put them on, then search for the Bluetooth 4.0 button when they're on your head, to pair with whatever device you're using. These buttons are situated on the right earcup, as are the micro USB slot and mic. On the left side is the 3.5mm hole, which you can fill with a cable for Hi-Res Audio. So, where are the controls? Well, they're on the side of the ear shell. Swiping up or down controls volume, left and right switches between tracks, and a tap will pause your music. The touch controls are nice and intuitive, although it's a 'touch' annoying that Onkyo has added a beeping sound when maximum volume is reached and when you pause. It's not the nicest sound in the world and does grate after a while – especially when I accidentally paused the song I was listening to because I pressed too hard when trying to adjust the volume. This can only really be put down to human error, though, and it only happened a couple of times. The left ear shell contains all the tech you need for NFC pairing – still the quickest and best way to get any headphones paired with a phone. And that's your lot, which will please those who prefer their design to be both minimal and clean.